Tickets are now available for the 2013 JD Awards Banquet on Sun, October 27, 2013. BC Athletics and the Junior Development Committee are happy to announce the 2013 Junior Development Award Winners. Congratulations to all the selected athletes! The JD Awards Banquet will take place at the Croatian Cultural Centre in Vancouver, BC. Tickets will be for sale starting next week. 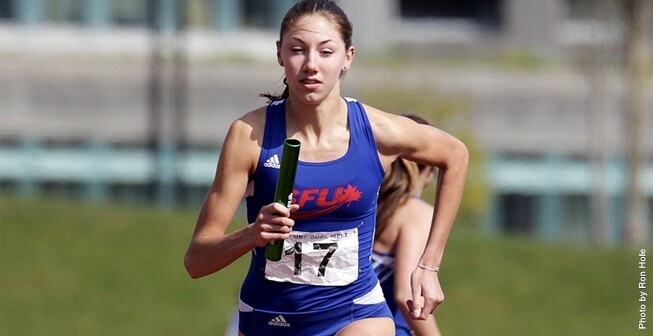 Burnaby – Two BC Athletics coaches have been named to the list of outstanding members of Team BC following the recent 2013 Canada Summer Games in Sherbrooke, QC. Nikki Reiter and Pat Sima-Ledding have been named as two out of the eight members of Team BC receiving ACE (Achieving Community Excellence) Awards. Both coaches out of Kelowna BC were integral parts of the BC success at the Canada Summer Games in Athletics this summer. Nikki is an athletics endurance coach and has been involved in the sport for 20 years. She currently coaches at the University of British Columbia Okanagan (UBCO) and the Okanagan Athletics Club. Nikki was nominated by her UBCO Heat Cross Country Team who praised Nikki’s work in organizing a series of fundraising initiatives that helped save the future of their club. Through her vast network, Nikki brings together runners of all ages and skill levels to train and learn together. Nikki was also a part of the Women In Coaching Canada Games Apprenticeship Program from the Coaching Association of Canada, where she has been mentored by new BC Athletics Coaching Education Coordinator, Jennifer Schutz. Patricia is an athletics coach and has been involved in the sport for 29 years. Patricia is the president, founder and a coach for “Competitive Edge,” a company that offers a unique speed training program to athletes. However, after work Pat spends the remainder of her day coaching with Team BC or her team of high school athletes at the Okanagan Athletics Club. Pat also serves on the BC Athletics Track & Field Committee and continues to dedicate countless hours to growing athletics in her community. The ACE Awards, founded by BC Athlete Voice and administered by ViaSport, are presented to a select group of Team BC athletes and coaches every year. The award acknowledges the importance of using leadership skills honed through sport to give back to the community, both on and off the playing surface. From an exceptional group of nominees, winners are selected based on their leadership in promoting sport and physical activity for the greater benefit of their sport and community.